The MELIPONARY and the NURSERY. TRAVEL through gardens and trails of the jungle. UNLIMITED SNORKEL in the river and the creek. REST AREAS with hammocks and lounge chairs. LIFE VEST, FLOATING TIRES and BIKES. SNORKEL EQUIPMENT with gift tube. Two circuits of RIVER TO TRAVEL IN RAFTS. Two circuits with 14 TIROLESAS. 10 KILOMETERS of route in two circuits through the jungle in AMPHIBIOUS VEHICLES. 400 meters of swim in RIVER DE ESTALACTITAS. EQUIPMENT INCLUDED to carry out activities. Important and attractive feature of Xel-Há is its cove, which is simultaneously integrated into a seawater inlet to the mainland. Home to 70 species of beautiful and colorful fish. Come and have fun in the water zip lines of this Wonderful Natural Cove. Start your Xplor All Inclusive adventure in a natural setting where you will discover impressive and ancient rock formations and you can perform activities with the most modern and safest equipment: Drive 10 km in amphibious vehicles above and below the earth; navigate on rafts along two circuits of 570 and 530 meters long on crystal clear waters; Fly over the jungle in the 14 largest zip lines in Latin America and swim 400 meters between ancestral caves. 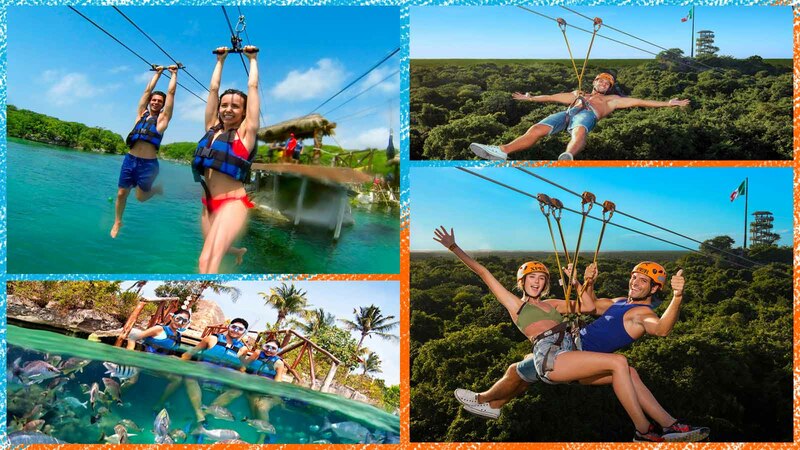 Visit Xplor and experience the most amazing adventure in the heart of the Riviera Maya, Mexico! Photographs and Videos, is purchased directly in the Park. Tips and Tours options within the Park. The Xel-Há Park opens 365 days a year, with a time of 9:00 a.m. at 5:00 p.m.
Children under 4 years old are free. It is necessary to present identification at the ticket offices of the Park. Children from 5 to 10 years old pay (indispensable to present identification at the ticket office of the Park). It is not possible to change the date on the day of your visit. Wear comfortable beachwear and swimsuit, bring an extra change. Sunscreen and insect repellent should be free of the following chemicals to be used within the Park: Benzophenone, Ethylhexila, Homosalate, Octyl Methoxycinnamate, Octyl Salicylate, Octinoxate, Oxybenzone, Butyl Methoxydibenzoylmethane. In case of not fulfilling this requirement, in our information modules you will receive a sample of chemical-free product in exchange for your sunscreen or bronzer; which will be returned to you upon departure. Carry money in cash or card to buy souvenirs, carry out some optional activity or acquire photos of your visit. Wear comfortable beach clothes, shoes for water, a change of extra clothes, a bathing suit and a towel. Remember that you can buy the water shoes inside the Xplor stores. The sunscreen must be free of chemicals to be used in the Park. If it contains any of the following ingredients, it can not be used within the Park: Benzophenone, Ethylhexila, Homosalate, Octyl methoxycinnamate, Octyl salicylate, Octinoxate, Oxybenzone, Butyl methoxydibenzoylmethane. The minimum age to enter Xplor is five years. Children between 5 and 10 years old pay. It is essential to present official identification at the ticket office of the Park. $ 137.00 Juniors 5 - 10 Years.